Exploring a faraway place by bike, having your breath taken away by dramatic scenery and settling down for a sunset picnic to round up the day all sound pretty dreamy to us at YHA. The good news is that you don’t have to leave the UK to experience all this and much, much more. Discovering new places by bike engages all your senses, forcing you to connect with a place in a way you haven’t experienced before; it’s also ideal for visiting often missed pockets of local food and culture and getting to know the essence of a place. 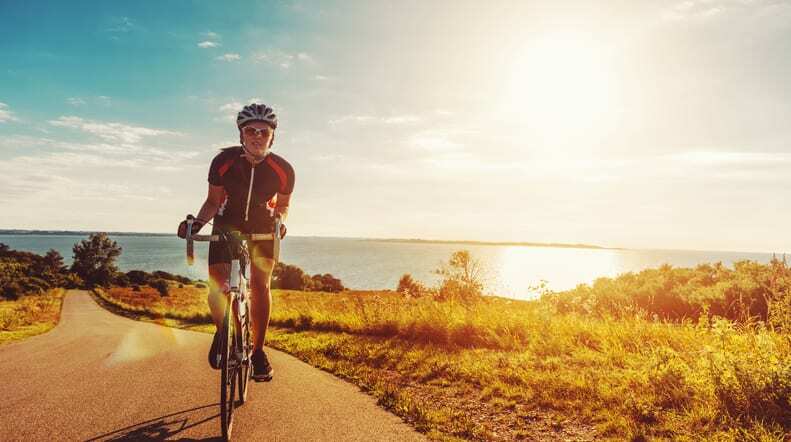 Whilst weather can be a hindrance to many holidays in the UK, when it comes to cycling, it’s actually pretty ideal – the mildness means that you never have to worry about temperature extremes. Read on to find out what the UK’s most scenic cycle routes are and the best YHA places for you to stay in along the way. If you’re after an adventurous challenge then you need to make your way to Scotland for a cycle route you won’t forget, and some of the cleanest air in the kingdom. The route takes you from Dingwall to the Victorian spa town called Strathpeffer, heading past astonishing scenery of Loch Garve where you’ll encounter ancient trees and shimmering waterside. You can choose whether to make your route long or short, depending on how much you want to see, as it’s a truly customisable experience based on your fitness ability and length of stay. Surrey famously has a reputation for being quite flat, which may not excite some but will be music to other’s ears. The truth is that a cycle route around Surrey will present you with a combination of sprawling and relatively flat land and a few hills on the way as well, so you don’t have to worry about getting bored. The Surrey Hills Area of Outstanding Natural Beauty is, as the name suggests, truly stunning with places like Pebble Hill for you to explore. For a suitably local stay, check out YHA Tanners Hatch – a cosy cottage, surrounded by lush National Trust woodland. It’s not every day that you can experience sand dune views with distant mountains, all the while cycling by a secluded coastline. Well, all of this is possible if you plan a trip to the North Welsh Coast, passing through a virtually traffic-free route from Bangor to Conwy, exploring the historical Llandudno and Colwyn Bay resort. One thing to note is that wind will be your constant companion on this trip so follow the advice of seasoned cyclists and ride from west to east. Choose from contemporary lodgings like YHA Conwy or YHA Idwal Cottage for a picturesque break. Sometimes you only have a day to discover a new area and see some spectacular sights. For days like this consider routes outside the city as the UK has an abundance of green spaces close to most. The ride from Hampton Court to Putney in London, for example, is especially pretty. It will take you by the impressive Hampton Court Palace and into the unmissable Richmond Park; be sure to stop at the London Wetland Centre and explore everything it has to offer. This is a fairly easy and flat 12-mile ride through streets and riverside paths and YHA has plenty of places to stay in London.